I was talking to a customer the other day, he was a much older gentlemen, and as I have been graced with the gift of gab, we started talking. I found he lived in the same town that I do, just minutes away actually, where he has land. He began telling me about some of the things he is growing, it was not long before gardener stories began flying. I mentioned to him that I decided to grow cotton this year, that I am so happy I did because this plant is really wonderful to watch grow. 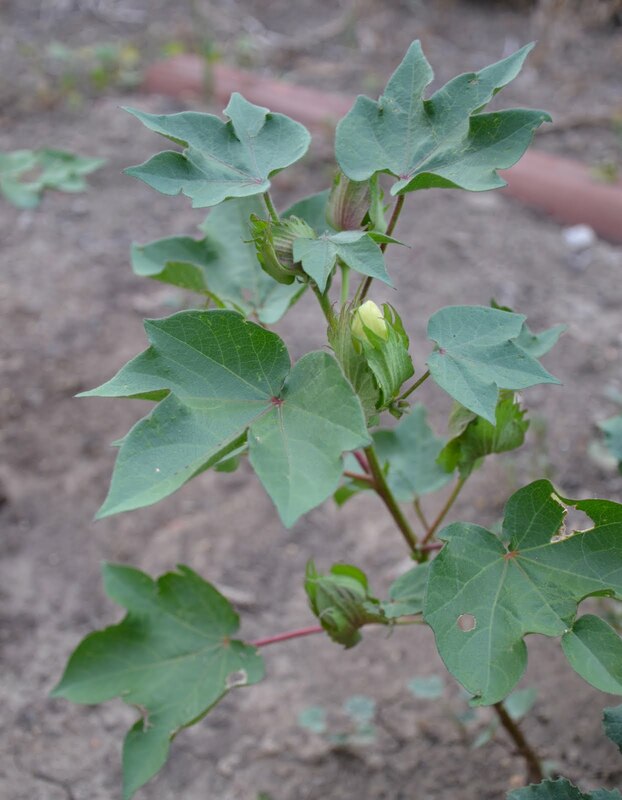 He looked at me and said, “Honey, what in the world made you plant cotton?” I told him that I like to plant something new each season, I read that this was a beautiful plant to grow, so given the history of the plant, and my love of sewing and fabrics, I had to plant it. Turns out this man is an old Texas cotton farmer! well! from there on out, it was nerdy geeky farm talk which I completely loved. I was struggling through all the technical terms of growing cotton, he helped me along, added little bits here and there, as he told me stories of growing up on a cotton farm. He told me that when he was growing up in Texas, all the girls, (everyone really) had fingers that were disfigured from picking cotton. He talked about wearing gloves with the finger tips cut off so they could save their hands, but there was no way to save the finger tips, not when picking cotton. He was telling me of things I have only read in books, or seen in the movies, he was a wealth of farming knowledge, and I was completely taken with him. It a great conversation, one I won't soon forget. He was telling me secrets for growing tomatoes, and okra, then at one point he mentioned a food saver, asked if I had one. I said, “no, I lost that in the divorce” which is true, my husband wanted to keep it, but that's a story for another day. A little later in the conversation he said, “you still divorced?”, “yes” I said, he looked at me and asked, “You wanna get married?”, we both had a good laugh at that!!! It was so fun and refreshing talking to an old farmer, he was completely interesting, someone who has worked hard his entire life, someone who gets it, who actually shared many of the same goals that I do. He told areas of Texas I should drive through to see all the beautiful cotton fields, he shared so much in a short amount of time, but, the thing he left me with was this, “If you love to plant, to work hard, to farm, don't waste that gift. Get some land and make your dreams come true. The younger generation needs to understand hard work, where our food comes from, and the great feeling you get after putting in a hard days work.” Suddenly, I felt validated and not nearly as crazy as some of the people around me make me feel. With one customer, one conversation I did not feel nuts for wanting to grow things, for wanting to be self sustaining, to homestead. He encouraged me to write down all that I am learning along the way so that it is not lost, so it can be passed on. When he found out I sew as well, he just kinda laughed and said, “honey, you have it all.” Then, as always happens to cut good conversations to short at the shop, the phone rang. With that I bid him a wonderful day, and fabulous weekend, he replied in kind and left the shop. I was elated the rest of the day, telling everyone I had a marriage proposal from a cotton farmer, a dream come true :)! I could have talked to him all day, in fact, I found myself thinking I should call him for coffee or something to just talk to him a little more and see what else I can gleam from him. I was rejuvenated, and excited to plant more in the yard, learn more, DO more! 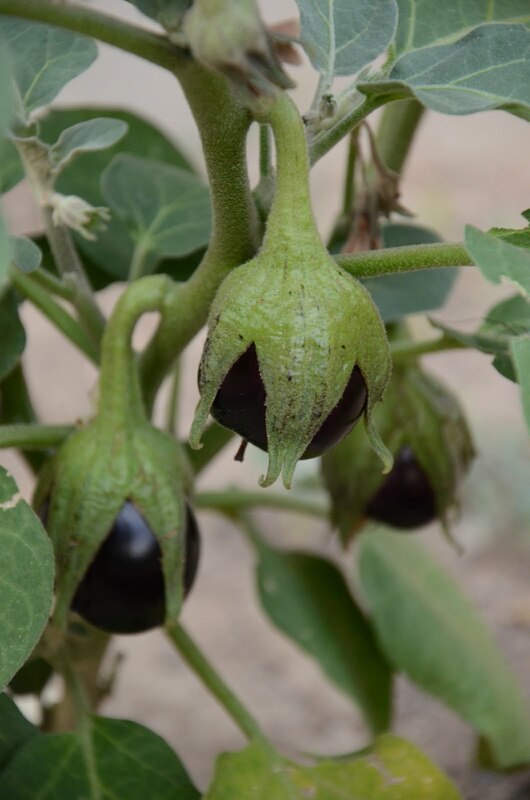 He did suggest to a new plant to me that will be my “never planted before” crop for next season, the purple hull bean or black eyed pea. The cotton is really doing cool things right now. This is a shot of the newly formed squares beginning to emerge, its either super exciting or I am a massive dork! hehehe :). These guys need 160 days to do their thing, so I am hoping the continued heat will do the trick. The heat is getting to me, but its helping the cotton, so go Mother Nature, bring the heat! 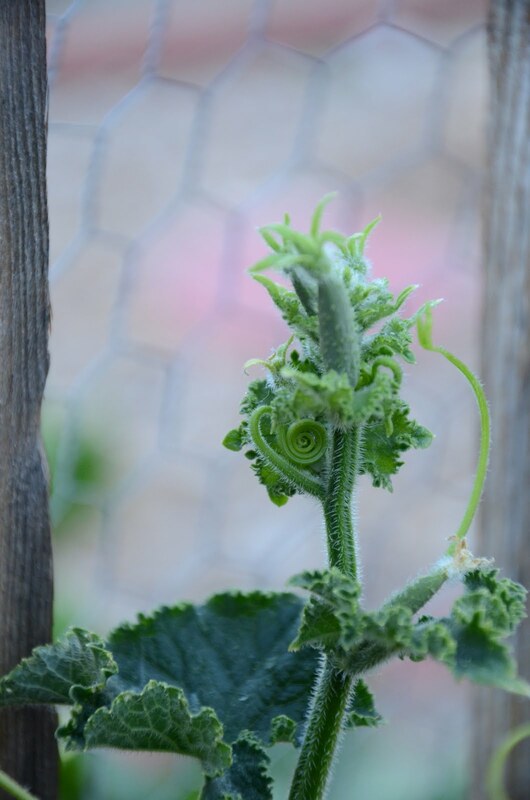 This is the cucumber reaching out and holding on. 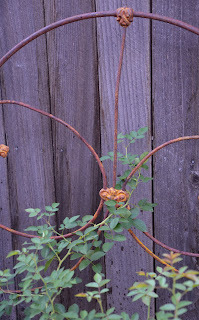 Its one of my favorite things in the garden, really fun, almost childlike to see how it just reaches out and grabs things, and how tightly it hangs on. 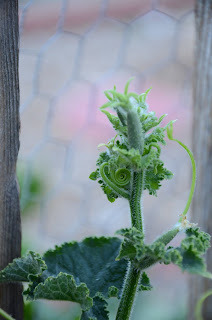 The cucumber is curly, really holding onto the chicken wire, I love it! 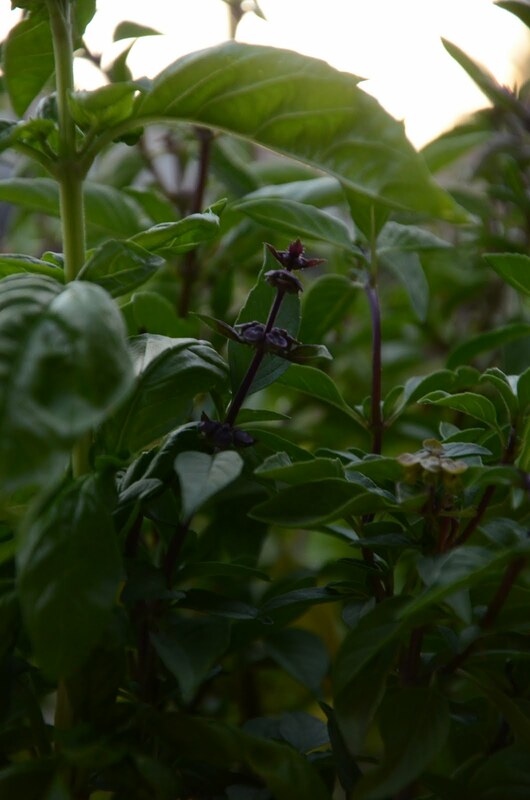 BASIL!!! Thai and sweet mixed together, walking by these planters smells so good! The sun setting on my snap dragons, these flowers make me very happy! 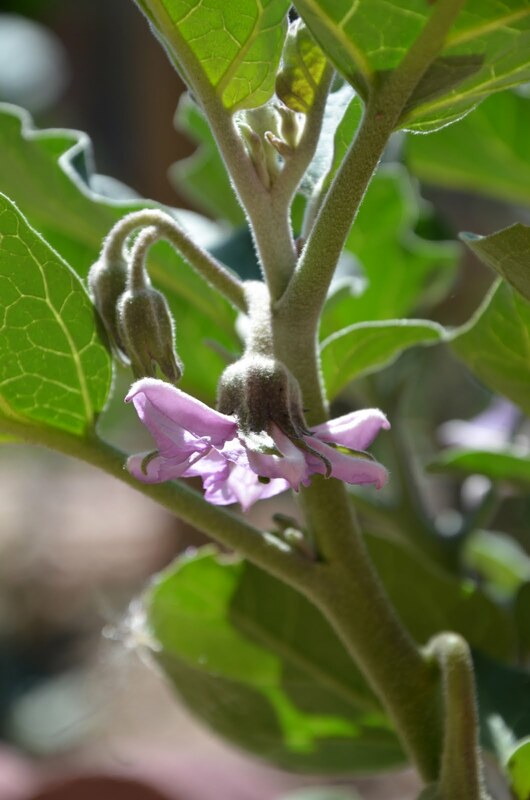 The eggplant is a little behind, but its officially my first ever, thanks to my friend Marsha who had an extra plant to share! I promise to post more stuff outside of the garden realm soon, its just so awesome in the garden right now it can't be helped!! Happy Day ! Its been an extremely long and hot week, but a few things have managed to make me laugh. Yesterday morning when I went to leave for work, I noticed the cat had got nice and cozy in my veggie picking basket, HA! He looked comfy, but it just made me giggle. This morning I woke up so nice and cool and cozy in bed, that it made me giggle, been a long time since I woke up giggling. :) Happy day! These two little squash just sorta looked like a heart to me, of course I knew I would always find love in my garden. This is a shot of a some of the garden booty over the last few days, I can't wait to make salsa with the tomatillos!!! The okra is so good, I've just been cutting it up and tossing in my salads, but I am going to have to fry some up soon! The anaheim peppers are so good, they are almost smoky in flavor, I am excited to get more of those for sure. As always, Arty follows me about, when I sat at the table with all the goodies he had to come over and inspect them, then he layed around on the table. Goofy cat. 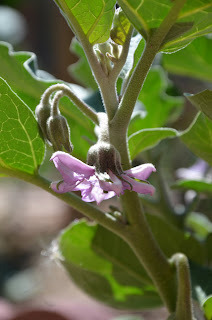 Thanks for stopping by and checking out my blog, there will be much more to come, as I will be blogging more often, and adding some of the sustainable/urban homesteading things I am working on in the near future. 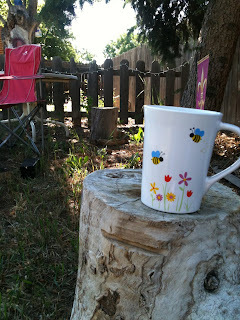 Check back when you can, good things are happening at here in my little cottage garden, have a spectacular day. 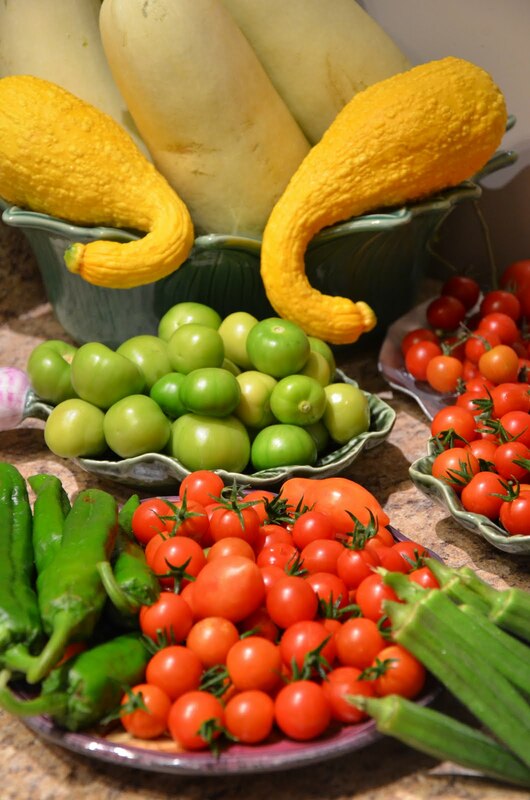 There are so many good things going on in the garden right now, although I am getting sick of zucchini and squash, the cherry tomatoes are going strong and my favorite little snack while gardening. I love eating them when the are just picked and still warm from the sun, its like eating sunshine! Here is a shot of the pumpkins with squash, corn, eggplant, and rosemary in the background. Super curly goodness on the cuc vine! 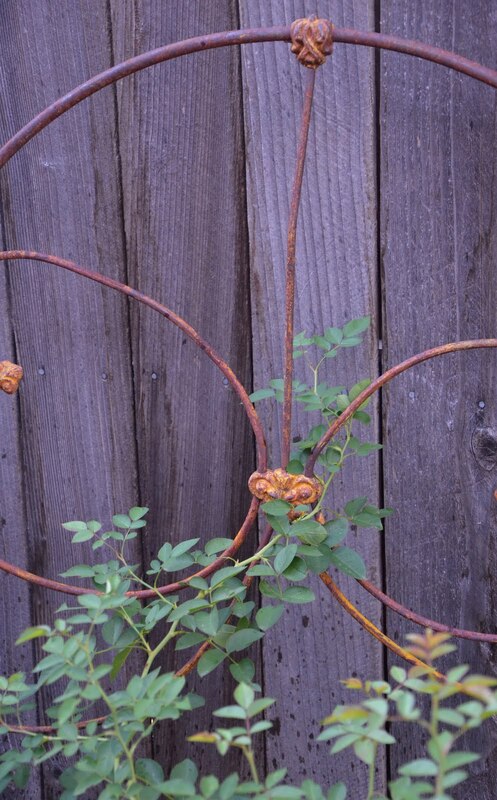 I love watching all the little vines twist curl and find all the little places to grow out into. 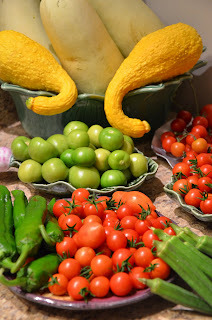 I think half the fun in the garden is watching how everything grows, once I get to this point, I don't really care anymore if I get any veggies out of them, I really enjoy watching the process of growth. This is a shot from my garden window this morning, probably completely boring for most, but I love watching my cat sitting and relaxing in my garden. It makes me so happy. I took a trip out to one of my favorite you pick it farms with my friend Marsha this weekend, it so fun to visit there, but as usual, I got busted for wandering around the rows I was not supposed to be in. Once I start looking at all the plants, I just kinda zone out and forget to follow the rules. The cotton is on the move and really doing cool stuff. I don't think I will be able to get it to its full bloom time, but the warmer weather is really helping right now. This plant is really making my summer! 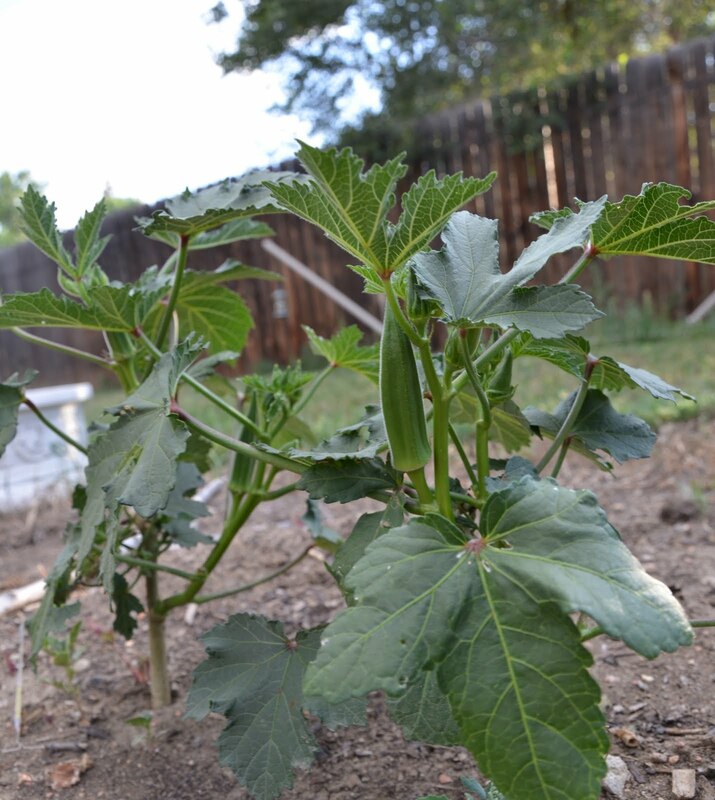 The okra keeps going strong as well, I just can't get enough of it! I have been working on my rose garden little by little this summer, but I finally got one of the bushes to work up and vine into the old bed frame I have in the garden. :) I love it!! woohoo!! Purple roses make me so happy! I took a trip out to one of my favorite you pick it farm, Berry Patch Farms, with my friend Marsha this weekend. It so fun to visit there, but as usual, I got busted for wandering around the rows I was not supposed to be in. Once I start looking at all the plants, I just kinda zone out and forget to follow the rules. The above shot is of the little shopping area at the farm where you can just buy the already picked goodies. These sun flowers at Berry Patch Farms were wonderful to gaze at! I need to grow this variety next year!!! I hope everyone out there is enjoying the beauty around you everyday! hugs and love! Watering the garden this morning, this beautiful bloom caught my eye from across the yard, I was so excited!!!! Pumpkins officially in the garden woohoo! It is no secret that my garden brings me great joy, but today it added a new joy, it actually surprised me. First, upon my arrival home I noticed this sunflower blooming in my front yard. It may not look like much, but to me, its a triumph of great accomplishment! For years I have tried to grow sunflowers, something has always hindered me, animals peeing on them, wind breaking them, or simply to much or to little water, but today, my first ever sunflower showed itself to me just when I needed it. I actually gasped when I pulled up and saw it, almost locked my keys in the car because I couldn't wait to jump out of the car to get a closer look at it. I love watching all the different phases of plant growth, love letting things bloom out and just do their own thing. These plants are fabulous to watch in all the many stages! There's a few varieties growing, one of the giant sunflowers actually feel over and broke the stalk a few days ago, so I was really let down. I am hoping that the other giants make it, I gotta get out there and stake them!!! Another surprise in the garden today, the cotton! 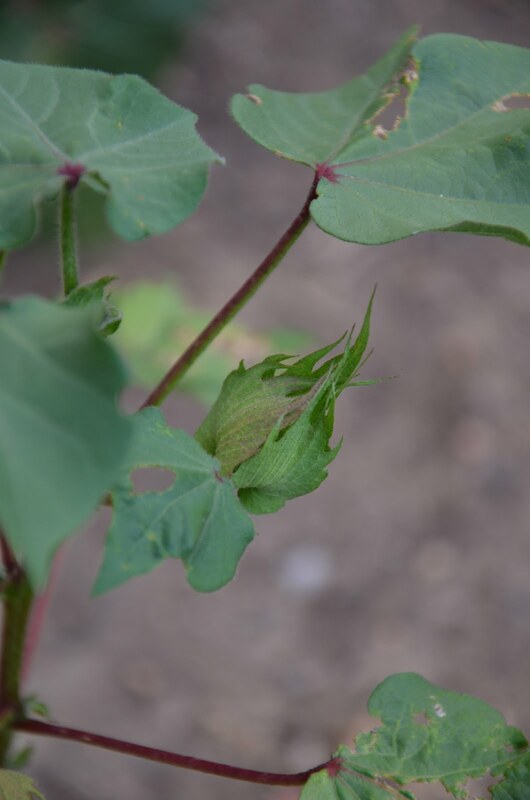 The cotton has not done much all summer, however, just in the last two weeks it has really began to change, The leaves are getting much bigger and "squares' are beginning to form. With luck, they will keep up the good freaky reproductive work, and blossom into flowers soon. This plant is pretty amazing, and complicated, the heat has been helping, but I am afraid the cooler nights might stop some of the growth. Either way its been fun to watch and learn about this very cool plant. If you want more info geeky plant info, (the type of which I love) check out this website on growing cotton. Even HRH Arty is enjoying the big leaves of the pumpkin plants! I love this photo :), even the cat its taking time to "smell the flowers". These happy garden surprises made my day. Sometimes we work in the garden so much, it just feels like all of a sudden one day, everything is blooming and out of control. I see it daily, so when I have friends over who haven't seen things in awhile it reminds me that all of the hard work and planning are totally worth for it days like this. Days where the hard work disappears, and "surprises" abound! Happy gardening!